BRANDON, Man. — There was a time in Mike McEwen’s curling career when he never imagined wearing a baseball hat on the ice for every game. Then, he joined Team Carruthers — and everything changed. When McEwen wears a hat, the team is undefeated. The streak is now at 15 games. The Carruthers rink has not lost a game when McEwen and second Derek Samalgaski have both been wearing hats. McEwen doesn’t want to talk a lot about it. Superstition is a thing, to be sure. But team lead Colin Hodgson is happy to chat about it. “Once you’re on a heater you can’t stop it. So he hasn’t taken it off,” Hodgson laughed. So how did this all start anyway? The team had just purchased a bunch of hats from Dynasty Curling — a show of support for Hodgson’s curling apparel company. The team was down in Arizona playing in the Ed Werenich Golden Wrench Classic at the end of January and were sitting with a 1-2 record. That’s when McEwen and Samalgaski decided to wear hats. They didn’t lose another game at the bonspiel, finally winning it all with a 6-5 win over Kirk Muyres’ Saskatchewan team in the championship game. But for whatever reason, the team decided to take the hats off when they entered the Manitoba provincials for the first game. They fell 9-5 to the 16th seed Terry McNamee forcing them to take the long road to the championship — they’d have to win three consecutive B-side games just to qualify for the eight-team playoff round. 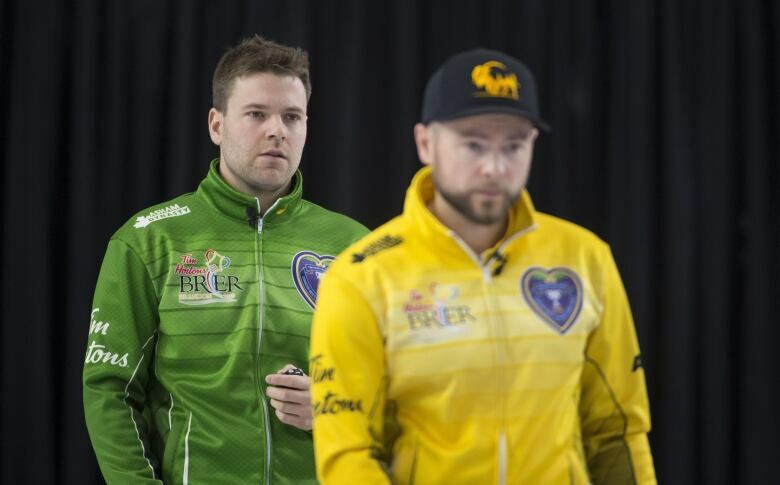 The rally caps came out after the loss, and the team has won every game since, including their opener at the Brier against Saskatchewan in a wild affair which saw McEwen, donning a black hat with a yellow bison embroidered on the front on his head, draw for two and the win in the tenth end. McEwen says he’s never had more fun on the ice. But at the same time, he admits that this season with a new team and a lot of adjustments is very difficult. They seem to be figuring it out at exactly the right time. Light-hearted. Not so serious. Easy going. These are the things McEwen says he has to remind himself of on the ice. There’s one player on the team not wearing a hat — the fashion man himself. Hodgson refuses to wear a hat, mostly because of his eye-catching hairdos. Slicked back with enough gel for everyone on the team, Hodgson’s hair certainly doesn’t lack flair. Quaffed perfectly on the top, and then shaved tight at the sides — with a lightning-bolt looking design etched into the remaining buzzed hair. Suffice it to say Hodgson would never want to cover it with a hat. But there’s more too it than that. Hodgson won’t be wearing a hat. But rest assured, the rest of the team will be.